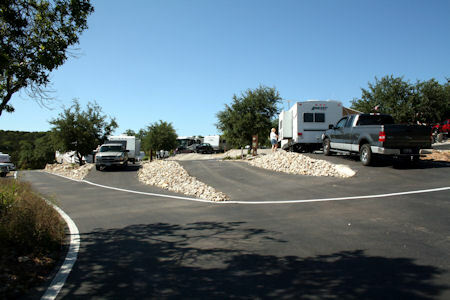 All roads and camp sites are masterfully paved. Memorial weekend (2009) I had the pleasure of getting together with my extended family at Lake Travis in Lago Vista, Texas. Although I was assured that there was plenty of room at my Sister in Law's house on the lake I elected to find a RV Park nearby. 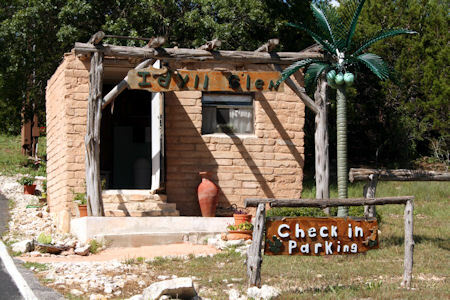 I was pleasantly surprised to find Idyll Glen RV Park just a few miles from the family house. We called ahead and made reservations and given some good advice on how to find the place. It is on the main road (FM 1431) but local sign restrictions prevent the owner from putting a sign big enough to easily see. It was also recommended that we call ahead when we were 20 minutes out. This is to assure someone is there to guide you to your place which here is very important. The area around Lake Travis in the Texas Hill Country and in this area it lives up to its name. The entire RV park is built on the side of a hill. Someone did a masterful job of laying out and paving the roads and campsites on this three dimensional landscape. There are a few what I would call semi permanent residents at the park. Sometimes this is not a good thing but these folks had some of the nicest landscape work I've ever seen. There is also a nice laundry facility and large meeting hall with kitchen. 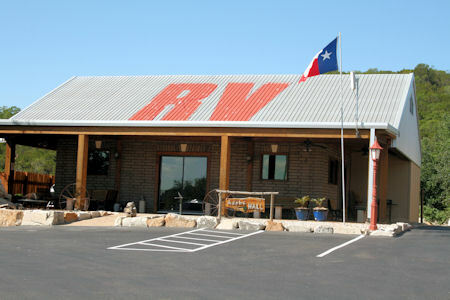 Overall its a beautiful RV Park in the Texas Hill Country close to Austin and Lake Travis. The only thing I saw missing that you see at most parks was picnic tables. Cost: $33.00 a night (May 2009) - No Credit Cards accepted cash or check OK.